Scholastic Inc. began nearly 100 years ago with the singular mission of helping young people understand the world around them. 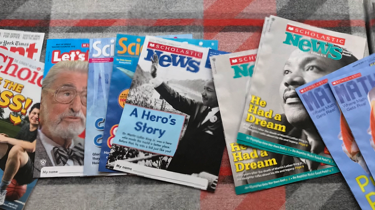 Today, Scholastic is the largest children’s publisher in the world, and we produce more than 30 unique magazines for all ages. New teachers continue to discover why our magazines and digital resources are trusted and loved by educators everywhere. Magazines are not only exciting; they work. Expertly researched and written, our early-learning, ELA, and content-area narratives are specifically constructed to ensure the intended audience finds them relevant and relatable. Editorial expertise ensures each issue is leveled to meet a student’s precise degree of proficiency. As students’ reading skills progress throughout the year, so do the complexity of our texts. Stunning photography and exciting text features attract a student’s attention, while unforgettable stories hold it page after page. Teacher-vetted lesson plans, powerful differentiation tools, assessments, and activities make it simple, effective, and joyful to teach with classroom magazines.